La Semana Santa (Easter) is finished and we start the long way to summer holidays. There have been days of faith and prayers for some and a week of beaches or hiking for others; Seville was crowded with believers, but Spanish coasts were full of tourists; la Semana Santa is one of the most expected time of the year, and this year, the weather has not disappointed. Religion in general, and Catholicism in particular, have been very important in our history and culture. Of course, this influence also concerns language and we have plenty of old sayings and proverbs which have reached our times. Today we’ll learn some of these. When we think about religion, two antagonistic concepts come to our mind: the father and creator, Dios (God) and the destroyer and enemy, el demonio (the devil). Let’s classify our sayings into these two groups. 1. Dios: In Spanish proverbs, God is considered as the one who rules, commands and decides human being’s fate and behaviour. A quien madruga Dios le ayuda (God helps people who get up early): People who get up early will make the best of the day. A Dios rogando y con el mazo dando (Begging God and hitting with the mallet): you have to work hard to achieve your goals; begging God is not enough. El hombre propone y Dios dispone (Men propose and God decrees): plans and intentions are useless; God will provide. Dios aprieta pero no ahoga (God pushes you but not chokes you): Difficult situations will be eventually got over. Dios los cría y ellos se juntan (God raises them and they get together): similar people, are often in the same group. 2. El diablo: On the other hand, the Devil is shown as canny, foxy and deceiver. Más sabe el diablo por viejo que por diablo (The Devil knows because he’s old rather than devil): you should listen to old people’s advices. Cuando el diablo no tiene nada que hacer, con el rabo mata moscas (when the Devil has nothing to do, he kills flies with his tail): we should be busy all the time, if not, we start thinking about bad thoughts. El rosario en el cuello y el diablo en el cuerpo (the rosary on the neck and the Devil in the body): there are people who try to show everybody how good they are, although they are very bad, indeed. 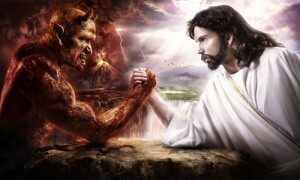 El que demonios da, diablos recibe (the one who gives demons, he gets devils). En arca de avariento, el diablo yace dentro (In the stingy’s chest, the Devil lies inside): people who are not generous, they are evil. We should probably run away from the extreme ends and should be in the middle. That is what this last proverb says: Hay que ponerle una vela a Dios y otra al diablo (you have to light a candle to God and another to the Devil): you should keep in mind all the options. Hasta otro artículo, si Dios quiere (see you in other article, if God wants).